Many supporters of Kumasi Ashanti Kotoko were hoping that, come next season Charles Taylor would be playing in the Qatarian league but their aspiration and their thoughts of hope has fallen through. The team pronounced that Charles Kwasi Asampong Taylor performance during the recent trial with the club was nothing to write home about. 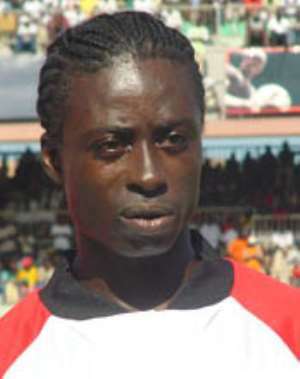 Secondly, because of the Kotoko confederation cup match, he Kotoko striker did not get enough time for the trials. A thorough investigation proved that, Taylor and manager Alhaji Bimbo would seek another transfer mission in Dubai after the confederation cup final. In another development Alhaji Yakubu –chief Executive of Brekum Arsenals has requested for the services of the following players from Kotoko, Hearts and king Faisal for the next football season; Luis Quainoo, Michael Ofosu Appiah and William Thompson from Kotoko, Hearts-Dan Oppong and Kwame Antwi; king faisal-Habib Mohammed. According to Mr. Yakubu, he has already sent official to such club for the release of the said players.